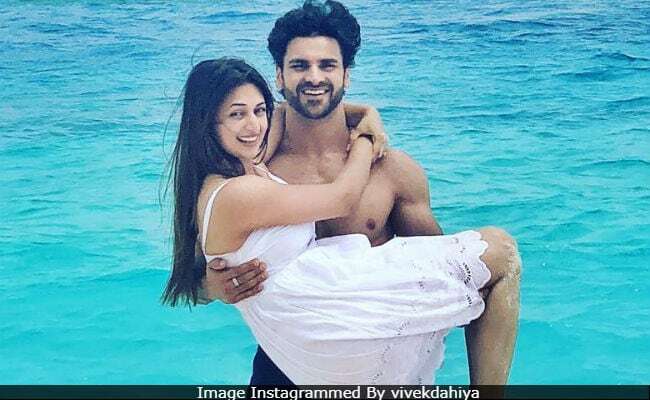 TV stars Divyanka Tripathi and Vivek Dahiya have jetted off to Maldives to celebrate their second wedding anniversary (July 8). Divyanka checked into the resort by posting a Boomerang video with Vivek and wrote, "Two years ago, at this hour dancing at our sangeet gave us a high. Today, it's the tranquil." Vivek also posted a lovely wish for his wife with a caption that reads as, "I watch chick flicks with her, she watches football with me." Before landing in Maldives, the couple made a stop-over at Colombo (Sri Lanka) and from there too, they delighted us with some pictures. Through the pages of Divyanka Tripathi and Vivek Dahiya's anniversary-special album. Craving to be in the lap of nature. Got our bags packed and off we go! (Happy wedding anniversary, Divyanka and Vivek). Divyanka and Vivek, both 33, fell in love on the sets of their show Yeh Hai Mohabbatein, headlined by the actress and Karan Patel. They had got engaged in January 2016. Their wedding was held in Bhopal, Divyanka's hometown. The wedding ceremony was followed by a grand reception in Chandigarh, Vivek's hometown. Here's a recap of their wedding. #FlowerJewellery I created! #DIY satisfaction. Divyanka Tripathi is one of top-rated TV stars. She debuted with Banoo Main Teri Dulhann and followed it up with shows like Ssshhhh...Phir Koi Hai and Mrs & Mr Sharma Allahabadwale. Vivek Dahiya's first show was Yeh Hai Aashiqui and he later appeared in Ek Veer Ki Ardaas...Veera, before Yeh Hai Mohabbatein. He played the lead in Kavach...Kaali Shaktiyon Se and Qayamat Ki Raat is his new show. Together, Divyanka and Vivek won Nach Baliye 8.